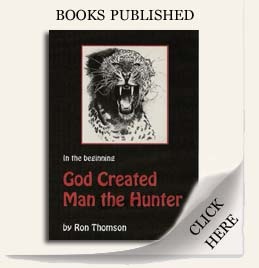 In recognition of his contribution to public awareness concerning the principles and practices of wildlife management and for projecting hunting in a positive light, Ron Thomson has received the following awards from hunting associations in Africa and across the globe. Associate Life Membership of the International Professional Hunters Association. 1992. Natal Conservationist of the Year Award. 1992. The Order of the Bateleur. 2012. South African Hunters and Game Conservation Association.